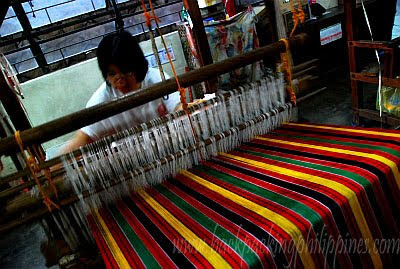 There's a place near downtown Baguio where you can witness how traditional fabric is woven by the Igorots of the Cordilleras; where you can buy native cloths for home or design your own fashion statement and also snap up Baguio souvenirs and handicrafts made the traditional way: Easter Weaving Room, located in the same compound as the Philippine Episcopalian Church. Easter Weaving Room is an institution more than a hundred years old that's been nurturing the age-old tradition of manual fabric manufacturing as well as provide livelihood to locals. 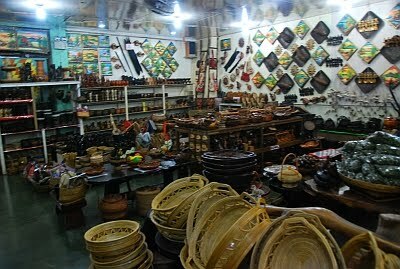 It's also a souvenir shop where various handicrafts, besides cloths and fabrics, are sold to tourists at not so touristy prices. Admission is free to Easter Weaving Room (no entrance fee) and is open 7 days a week but sorry, Tutubi wasn't able to get the exact opening and closing times plus contact numbers for you to call...probably next time. Driving Directions: From Baguio plaza, head to Abanao then turn right to Bokawkan Road. Turn left to Easter Road where the Easter Weaving School and the Philippine Episcopalian Church is located on your right about 500 meters from the corner of Bokawkan Road. From around Burnham Park, look for jeepneys with signboard Baguio Plaza-Quezon Hill-Tam-awan Village and request the driver to drop you off in front of the school, souvenir shop and Episcopalian Church. We bought (and framed) two pieces of cloth with jar design (for luck daw) from there. There are many such cloth with jar designs anywhere in Baguio but what is special in the ones we bought is the Easter Weaving Room insignia sewn in them. Extra Tip: mura at masarap ang pagkain sa tapat ng Easter Weaving Room, if the eatery is still in there, that is. there's really so much of baguio to explore. i'll swing back to this post again whenever we have a chance to go back to the pine city. thanks for sharing, tutubi. 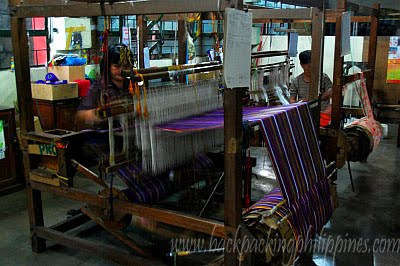 Wow, must be great to actually see weaving taking place. Baguio is one of the interesting and wonderful place in the Philippines. Aside from it's climate, and wonderful spots there...all the native clothes and souvenirs are really amazing. Their handicrafts were made by the Igorots.